Egg Fried Rice is a very simple and popular Indo Chinese recipe.This recipe is made with eggs, capsicum, onions. You can also use spring onions too. If you have leftover rice, you can use that too. The rice has to be cooled to room temperature as adding hot rice will make the rice stick to each other. Heat pan add oil,when oil gets heated add green chilies, onions and fry till they are golden brown. Add the beaten eggs and stir fry the eggs. Stir the eggs. Make sure to make small pieces of the egg. Now add the finely chopped cabbage and carrot, Fry for a 1 or 2 mins. Now add the finely long sliced capsicum. Fry for another 1/2 min on a medium flame. Add the garam masala and pepper powder. Stir well. Add cooked rice. Stir veggies and rice so that the rice does not break into pieces. Add salt. Keep on stirring lightly till the rice and veggies have mixed well. 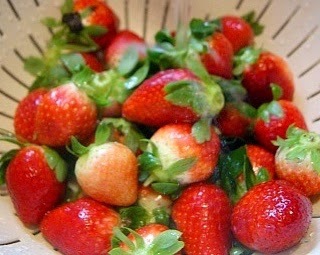 We can also use 1 tsp of lemon juice, for extra taste. 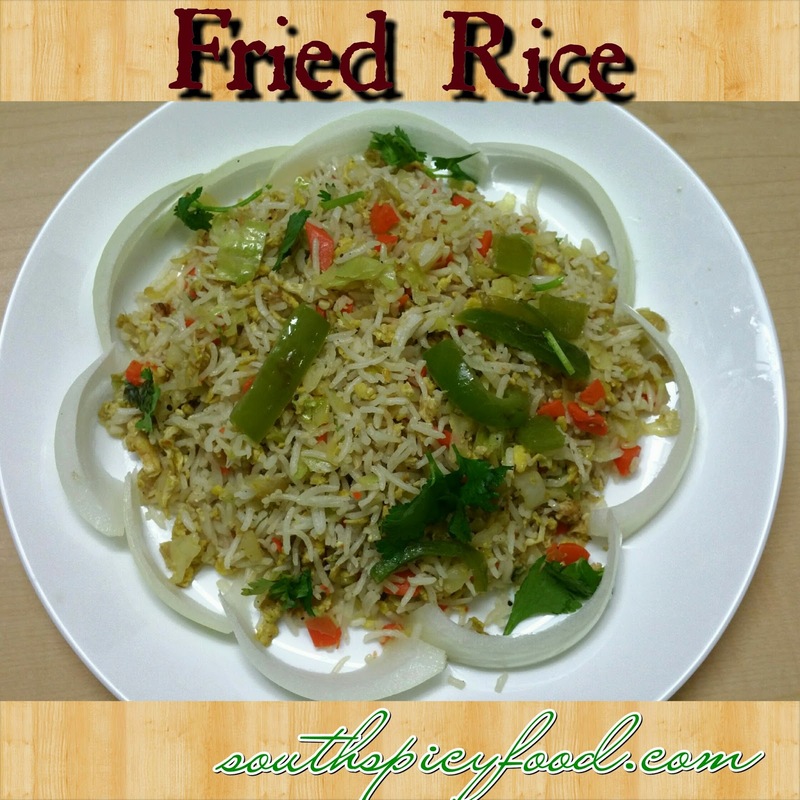 Garnish with coriander and serve hot.you This fried rice is good with out any side dishes. Making of Apple Avakaya with Green Apple ins very easy process.This pickle like andhra style and it is very tasty and healthy. Wash and dry green apple,cut into cube shaped pieces. Now add salt,red chili powder,methi powder,mustard powder,lemon juice and oil, mix well. 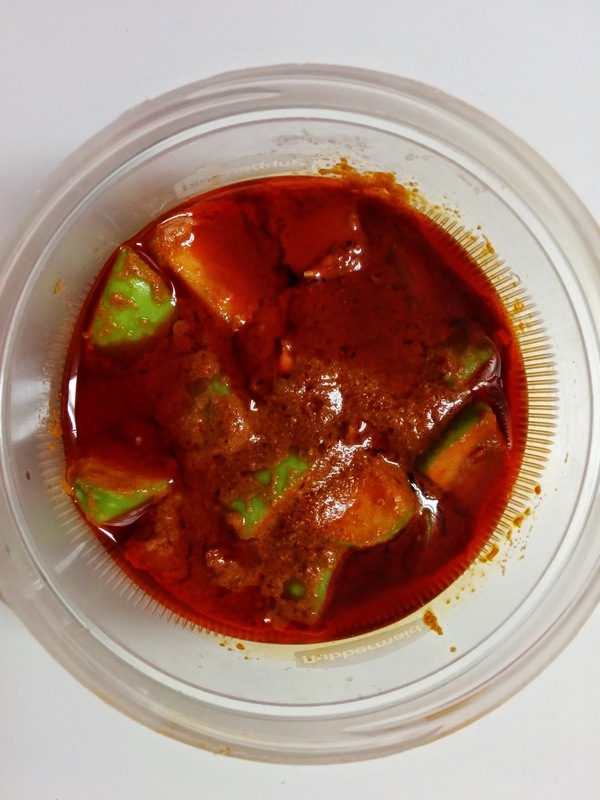 Serve the pickle after 1 day, so that all the flavors get absorbed. 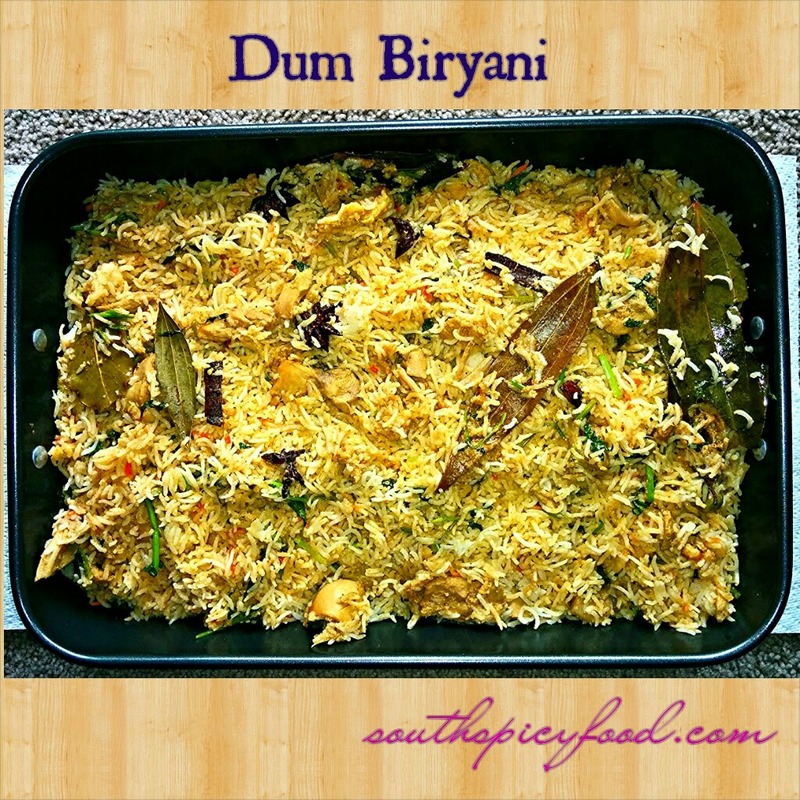 Hyderbad Dum Biryani made in oven is a technique of cooking in steam by not allowing the steam to pass. Hyderabadi Biryani in which chicken marinated and partially cooked basmati rice are layered and cooked on dum or slow flame along with herbs and spices. Marinate chicken with all the ingredients(For marinating chicken) along with biryani masala powder.Keep aside for at least 2 hrs. Wash the rice add enough water to fully cover at least 4" over the surface of rice and soak basmathi rice in water for at least 30 min.Add salt,Cloves,Cardamom,Cinnamon stick,Bay leaf,Oil,Shahi jeera,Star anise,Mace.Cook the rice till it is 60% cooked.That means if you hold few grains and press between tumb and forefinger it should be hard enough and also it should be mashed when you press.Drain water. Heat 3 tbsp of oil in a pan add 1/2 amount of onions slices,fry till they are golden brown(caramelized).Drain and keep aside on a paper towel for later use. Heat remaining oil in a pan,add Remaining onion slices fry till they are golden brown, and also add ginger garlic paste fry till raw smell leaves. Then add Marinated chicken. Keep cooking for 10 to 15 mins on low to medium flame. Now add lime juice, coriander and salt to taste. Mix well. If you are using the food coloring, take 2 cups of rice add food color(orange or yellow)whar ever you like, mix the rice till all the grains are well colored and keep aside for 10 minutes after you can mix all the rice together in a bowl for use in the next step. Grease a deep baking dish with ghee and evenly layer the cooked rice and chicken with gravy. least 2 layers (rice-meat-rice-meat-rice). Garnish with the previously caramalised onions. Cover the dish tightly with silver foil. Preheat oven set at 350 F/ 180 C for 20 minutes.Turn off the oven and let the dish sit in the oven till you serve. 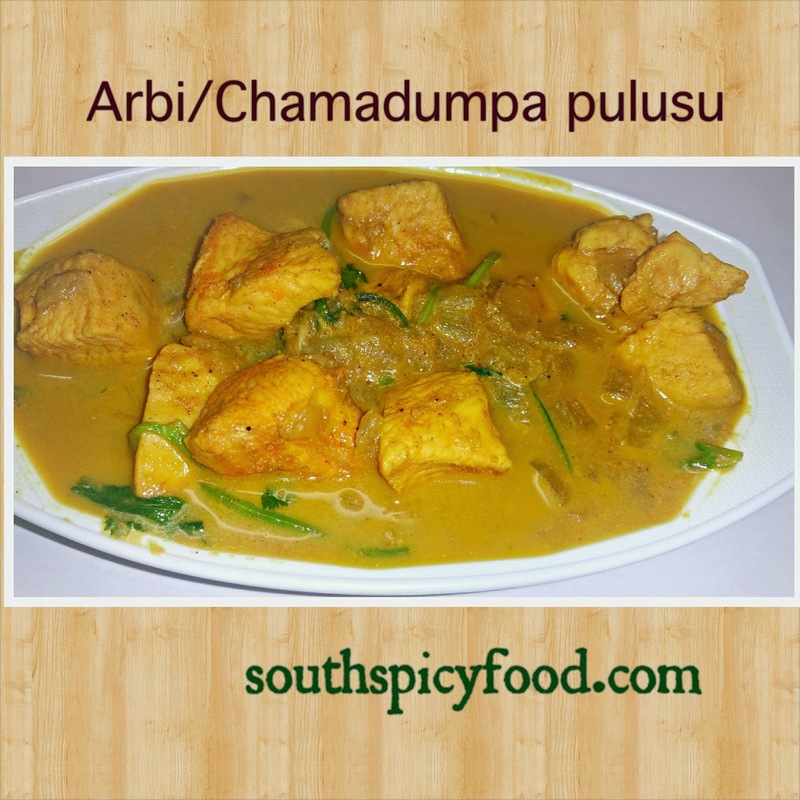 Chamadumpa pulusu is a traditional dish of Andhra Pradesh.Chamagadda/Arbi/Taro root is a spicy stew cooked with chilies,seasoning,tamarind juice and sweetened by jaggery. Boil arbi/taro root, peel of the skin and cut into medium size pieces. Add oil in a pan to this add 2 dry red chilies,mustard seed,menthi seeds,cumin seeds and curry leaves, fry till nice flavors comes out. Then add ginger garlic paste and fry oil for few seconds till raw smell leaves. Add chopped onions,green chilies fry till they turn to golden brown color. Now add arbi/taro Root,salt,red chili powder,turmeric powder,coriander powder and fry for 5 mins. Add tamarind extract along with 3 cups of water and jaggery. Check for salt, cook on a low to medium flame for 15 to 20 mins till pulusu consistency or gravy consistency. 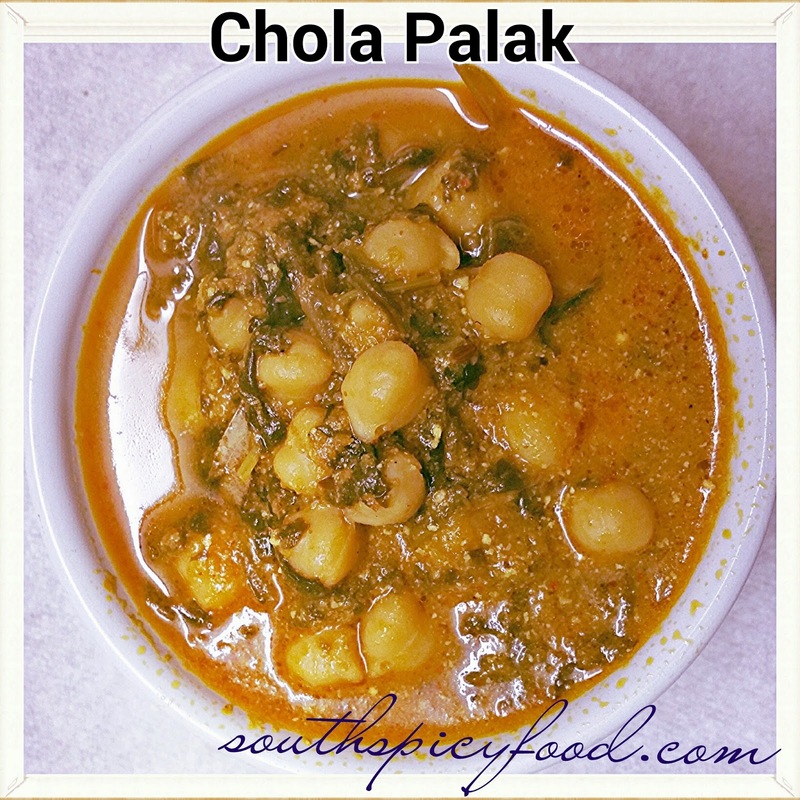 Chola palak is very healthy dish because of combination of spinach and chola, Palak is high in iron while chana is rich in protein.Palak and Kabuli Channa taste awesome when put together. First soak the chola for overnight. Pressure cook chola or chickpea till they are soft(it will take 10 to 15 mins for pressure cook). Blend the tomatoes and chilies to make a puree. Heat oil in pan, add cumin seeds.when cumin seeds cracks add ginger garlic paste, fry till the raw smell leaves.Add tomato puree,coriander powder,red chili powder,turmeric powder and cook on a low to medium heat till oil separates from tamoto mixture. Now add spinach, salt and 11/2 cup water.Cook on medium to low heat for 10 min's. Now add chola or chick peas, add little more water if needed.Cook for 10 min's or cook until to get gravy consistency. Add garam masala and serve hot with roti,chapathi,naan and rice variety. 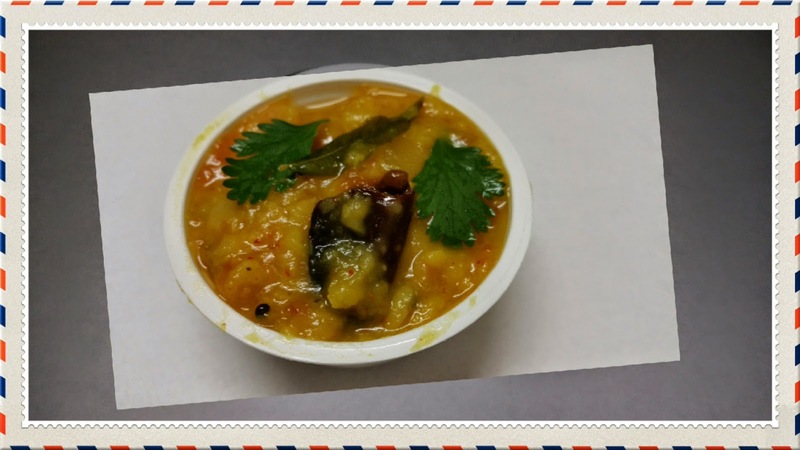 Tomato pappu is red lentil soup recipe.Tomato Dal/Thakali Paruppu Kulambu/Tomato Pappu/ Andhra Tomato Dal is a simple and tasty dish popular in South India. Heat oil in a pan, add mustard seeds, when they splutters, add cumin seeds,red chillies,garlic,curry leaves and fry for few seconds. when they turn light brown add sliced onions,green chillies and saute for few more seconds. Now add chopped tomatoes and saute for another 5 to 6 min's. Now add slightly mashed dal, turmeric powder, chilli powder and 1 cup of water to the mixture and cook for another 10 more min's on medium to low flame. Garnish with coriander and serve hot with rice or chapathi.